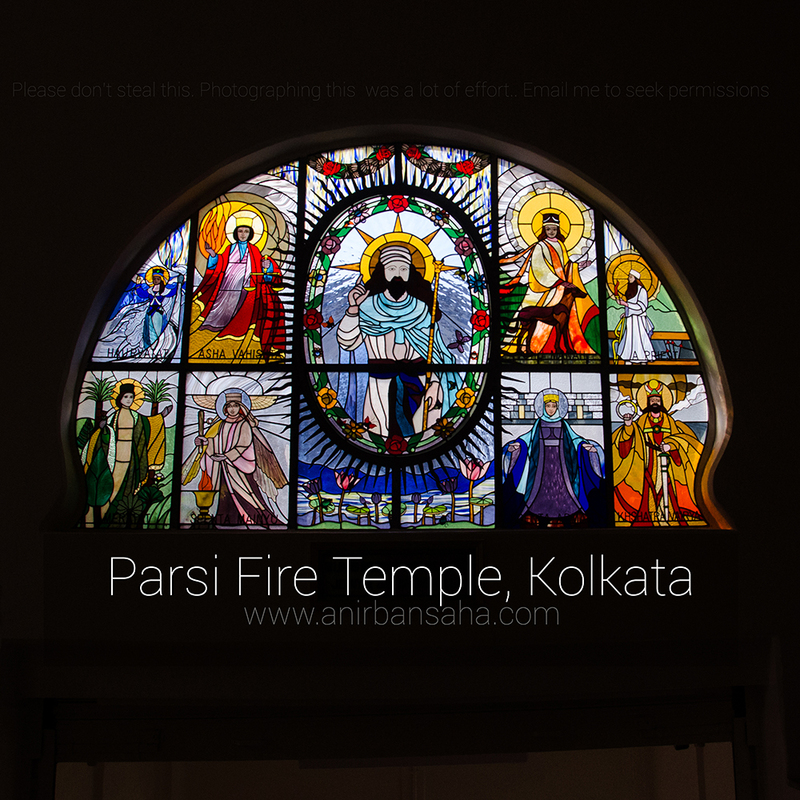 The Parsi Fire Temple in Kolkata is a place forbidden for any non-Parsi. But the forbidden things seem most tempting, isn’t it? When the temple was under renovation last February, I decided to give the place a visit. The gate of the Parsi Fire Temple in Kolkata (Calcutta) established in 1839. 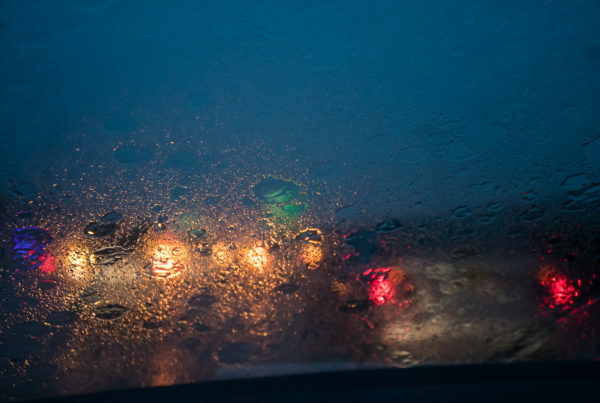 Before we proceed, there’s a brief background story which every reader should know! The Parsi community in Calcutta was thriving until near four decades ago with around four thousand people. Now even when the numbers have dropped due to various reasons like family planning, migration, restrictions on conversions, the spirit of the Parsi community is high and they are equally enthusiastic. The Parsis came to the Indian state of Gujarat nearly thirteen hundred years ago, from Pars in Iran after being invaded by the Muslims. They are Zoroastrians by religion and worship the Fire God. 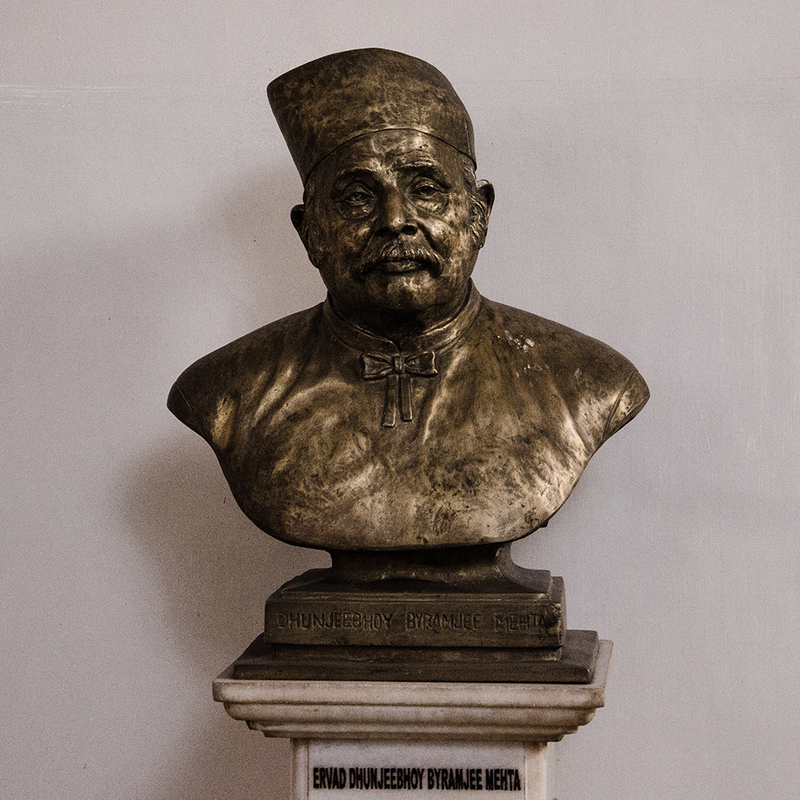 Dadabhoy Behramji Banaji in 1767 is the first Parsi to arrive in Kolkata. The first Parsi Fire Temple in Kolkata was established in 1839. There’s an interesting story about the arrival of the Parsis to India, which is now mentioned as “Qissa-i-Sanjan”. The Parsis were being persecuted by the Muslim invaders after the Zoroastrian king of Persia Yazdegird lost the battle. Then they moved to the mountains of Khorasan and lived there for a century. There they heard about India, the land of opportunity where they could live freely. They were headed by a Priest, who reached the shores of Gujarat with around 500 Parsi families and to seek refuge in King Jadav Rana’s kingdom. The King, as witty as he was, showed him a bowl of milk filled to the brim to show that his country was full and could not accommodate more. The Dastur (Priest) put a pinch of sugar into the milk, which immediately dissolved without overflowing the bowl of milk. By this action, he symbolised that accepting the Zoroastrians would mean they mingle with his people and add sweetness to their lives and country without upsetting the population. The Rana was impressed and he allowed them to settle in Sanjan under four conditions. They should lay their arms. Their women should adopt to Indian way of clothing. They should learn the local language. They should not convert any locals to their religion. The Parsi community in India is undisputedly one of the most peace loving section in the Indian populace. For over a thousand years, they’ve been effectively contributing to the growth of the nation. Some renowned Indians who hail from the Parsi community are Jamshedji Tata (& the entire Tata lineage), General Manekshaw, Godrej, Homi Jehangir Bhaba, Bejan Daruwala, Cyrus Broacha, Zubin Mehta, Dadabhai Naoroji (did you read class 10 history properly?) just to name a few. The Zoroastrians worship Fire as their God and people from other religions are not allowed to enter. There are even restrictions on people who have one parent who is a Zoroastrian. Thus not many could photograph their Fire Temple. During the International Kolkata Book Fair’s session on religious tolerance, Iftekhar Ahsan (founder, Calcutta Walks) was one of the speakers who spoke very briefly about Islam and what the religious text books say. The panel included prominent members of other communities which included the Parsis. 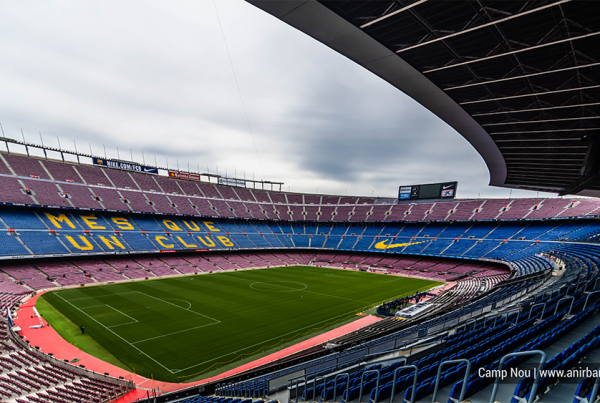 After the session in the VIP room, Ifte informed me that the renovation would continue for the next four days and that’s the best time to photograph it. Voila! The Fire was brought to Kolkata by feet and it is always kept kindled. 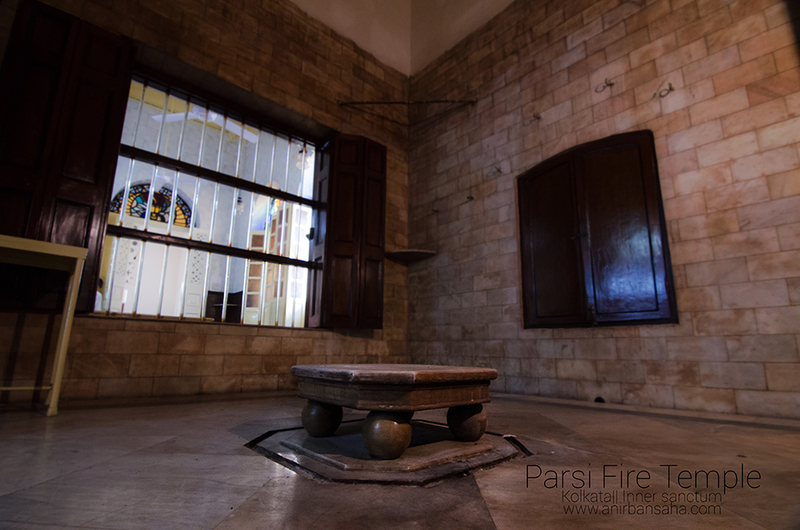 The first Parsi Fire temple was set up in 1839 by R. C. Banaji. It is in ruins now. The fire temple photographed in this blog post was established in 1912, by Ervad Dhunjeebhoy Byramjee Mehta. It is a two storey building. The first floor is spacious, marble floored and is very very peaceful. Inside the inner sanctum, a circular altar is located at the centre of the hall and is housed by the Holy Fire. During the renovation, the fire was kept away from the inner sanctum. I was so excited after having entered the Fire Temple that I ran directly upstairs. I forgot to check out the ground floor which Rangan da mentions in his blog post, houses the “grand father’s clock”. The central altar, where the Holy Fire is kept. 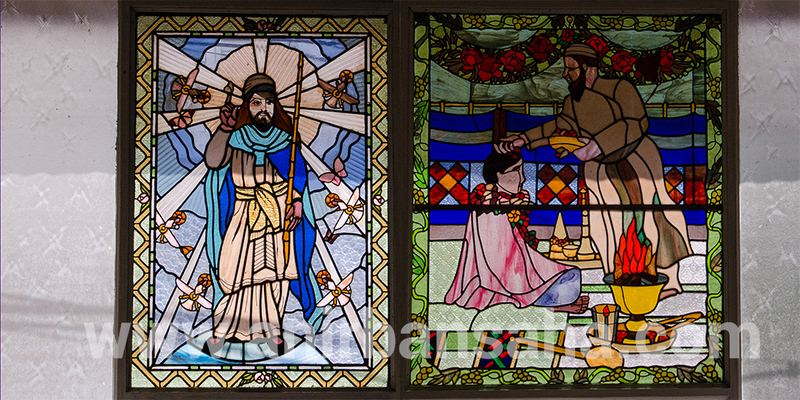 Each of the doors and the windows are crowned with the semi-circular stained glass, depicting different aspects of Zoroastrian iconography. Zoroastrianism, founded 6th century BC, was preached by prophet Zarathustra and is one of the oldest practised religions. The Zoroastrians flock to this Fire Temple during their new year day celebrated in August and on the birthday of Prophet Zarathustra (Khorda Saal). Their important ceremonies include purification ceremony, initiation ceremony, marriage ceremony, ceremony for the departed, ceremony for maintaining the Holy Fire and several other rituals. Gambhars are when rich offer food to the poor. Jashan is the thanks giving ceremony which is performed by the priests. 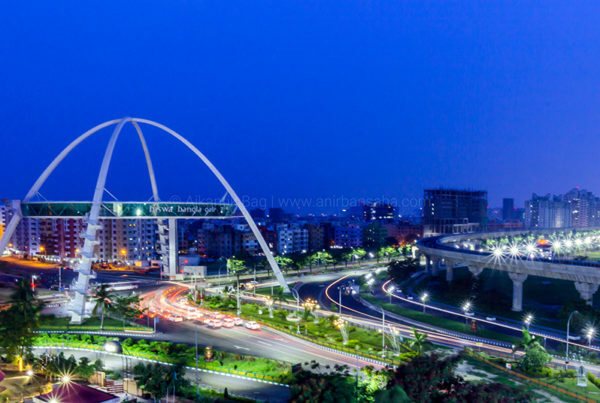 After the death of a person, s/he gives the final offering back to nature – the corpse is usually taken to the Tower of Silence (Beliaghata) to be consumed by the vultures in the city. 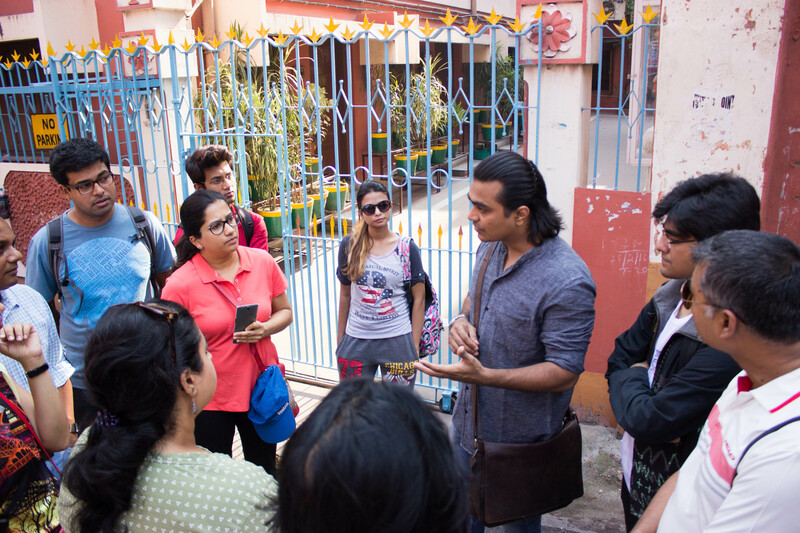 Ifte (Calcutta Walks) during the Heritage Walk conducted for “The Future of the Past” initiative. Photograph: Aikantik Bag. Call me ignorant, while Ifte was speaking about “Good thoughts, Good Deeds, Good Action”, I realised that the book in my school library where I got the quote from is of Arda Viraf who was a Zoroastrian. I’ve always followed this – Good thoughts, good deeds and good actions lead to ultimate success. I’ve always quoted that on my Facebook profile description. When I discovered this, I smiled. Growing up in Calcutta, studying in St. Pauls Mission School, living in Gouri Bari Lane (beside Parasnath Jain Temple), raised by my grand mother who was a Vaishnav and parents who are followers of Sri Sri Ramakrishna Dev, mixing with different people in Calcutta – I never knew when and how I’ve been imbibing different qualities and teachings from such diverse cultures around. Damn, I did not even know that they are different cultures all together. I hope you’ve enjoyed reading this post. Do leave for me honest feedback in the comment section. 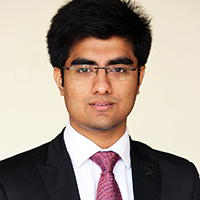 Next PostBengal Write Ahead: What's positive? I enjoyed reading the article, but I have to point out one common misconception mentioned here. Parsis do not “worship the Fire God” as the author states. We praise all the great creations – Sun, Moon, Fire, Water, Earth, Air, etc. for each of which we have short prayers of praise for their roles in maintaining life on this planet, and even then, each of these short prayers of praise start with the name of the One God Parsis or Zarathushtis (Zoroastrians) worship, Ahuramazda or Wise Lord. Parsis worship Ahuramazda, the unseen supreme all good, perfect, and unseen Creator, facing a source of Light, which can be the Sun or Moon when we are outside in nature, or it can be a wood or gas fire in a temple, or it can be a candle or electric light inside a residence. Just as we do not call Muslims as worshippers of the Stone God because they face the black stone building, Kaabaa, in Mecca, and we do not call Christians worshippers of the Cross God, so also we cannot call Parsis as worshippers of the Fire God. It is understandable that some Hindus who call each element of nature as ‘Dev’ or ‘Devi’ meaning god or goddess, may make the mistake of using that understanding for Parsis. Another misconception is about when Prophet Zarathushtra founded his monotheistic, revealed religion. It was not ” founded 6th century BC”, as the author states, but some time approximately more than 4,500 years ago, when the language of AVESTA (as sister language of Vedic Sanskrit) was spoken and used by Zarathushtra to compose his poetic teachings called GATHAS. In 6th century B.C. when the first Persian empire was established by Zoroastrian king, Cyrus the Great, the religion of Zarathushtra became famous as the majority religion of the Persian empires and rulers, at which time the language was Old Persian (very different from AVESTA). I thank you Sir for pointing this out. I would incorporate the changes and let you know.